There are love crystals beyond rose quartz? Just in time for Valentine’s Day, Rashia Bell breaks down what crystals you need to augment the love in your life. 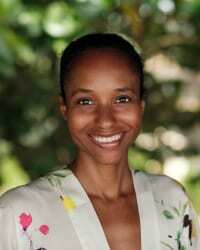 Rashia Bell is just one luminary you can learn from at a Wanderlust event this year. Catch her at the 2-day city Festival in Boston or the 4-day destination Festival in Stratton, Vermont. For tickets and more information, click here. Here we are… Celebrating that cherub- and chocolate-box-filled holiday for yet another year. Cherubs and chocolates have spawned card store and restaurant theme night spin-offs such as Galantine’s Day, allegedly the girl power equivalent to that couple’s holiday. Regardless, single or coupled, February is the month of the year when our minds invariably turn to love, and what it means for us. So let’s talk love. 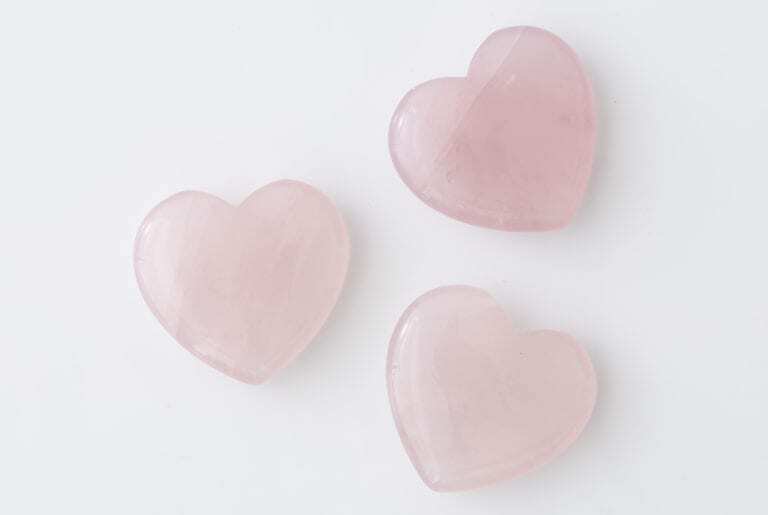 Rose quartz would unwaveringly be the first stone that comes to mind when thinking of stones that resonate with Valentine’s Day. Rose quartz is a gentle stone, exuding compassionate energy with its soothing pale (mostly) pink color. It corresponds to the heart chakra, where it aligns to the energetic pathways within the body. I’m asked all the time as to whether this is the stone that folks should use to attract a significant other, and the answer is both yes and no. It is a stone that is rooted in self-love, first and foremost. I believe that you need to start from that foundation and have that grounding within yourself to attract and welcome in a partner. Period. But there are oftentimes other areas in our lives that have nothing to do with the heart that we need to focus on first so that you can open yourself up to receiving love. So with that disclaimer, whether you are looking for a date for February 14—or just want to tap into some loving energy and create the ability to both share and receive that energy—here are crystals I’d recommend adding to your Love toolkit. Happy February! Rhodochrosite is a beautiful stone not to confused with Rhodonite, which is also a heart-based energy stone. The vibration of this stone is very balancing, as it draws from the energies of both water and fire. In that duality, it has the ability to both cool and soothe emotions, while it is also strength-enhancing as pertains to our will. One stone can contain a marbleized looking swirl of colors, ranging from white and pink to berry and black. As a heart healer, it is great at helping you to clear out any emotional cobwebs and is thought to help increase blood flow to the organs. We can draw upon that same energy when preparing for a romantic evening with our partner. Simply said, it’s a stone that lets cupid draw back its arrow and hit the intended target! Kunzite is a stone that radiates with divine love. In particular, it harnesses feelings of love to create with them an abundant reality that is rooted in both joy and gratitude. Its pale color between pink and purple allows us to help the heart receive unconditional love. Hiddenite, its sister or sub-category stone, is truly the yin to its yang offering additional balance and harmony and can help one accept change where they may not initially see its value. Hiddenite is great for someone going through a breakup, as it’s heart healing and gentle, and allows for deeper understanding in the journey that their relationship has taken. Malachite (buy it here → bit.ly/2HWDdVe). Photo by Joe Kramm. Pink stones don’t have a monopoly on heart-stimulation. Many green stones possess this energy as well. Malachite is one my favorites for the unique patterns that even the tiniest stone can hold. Each continuous line—and its varying shades of green within the stone—are about movement, energy flow and connectivity. 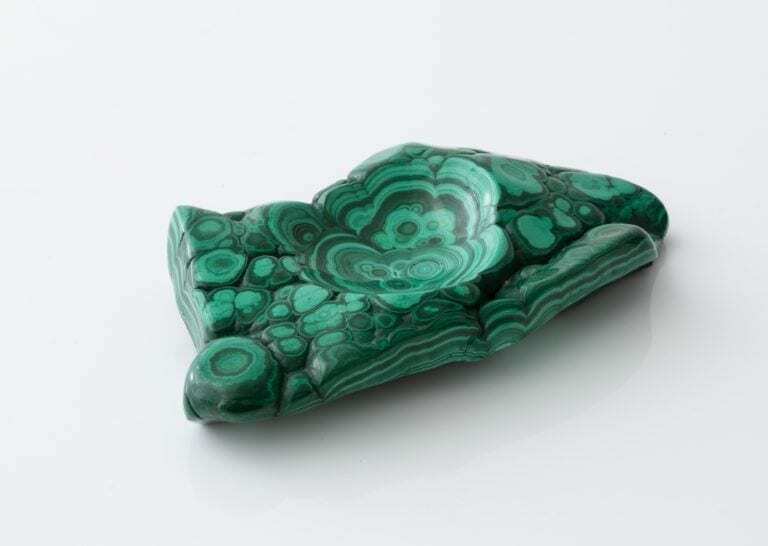 Malachite is one of the oldest noted stones in the world, going all the way back to the early Egyptians between 3000–5000 B.C.E. As an energy-amplifying and protecting stone, the Ancient Egyptians wore Malachite around the neck as a talisman for others to see. It was also crushed into makeup and worn on the eyes—don’t try this at home, we now know that in crushed form the dust can be toxic! For the Egyptians, Malachite was akin to showing off your new Sephora haul and your dating app profile heading all rolled into one. We can use its energy to manifest and make sure that we always fully express our emotions to those around us. There is no right or wrong way to incorporate crystals into your life. We often forget about the power in the jewelry that we wear, and the stones that they contain. The great thing about all crystals and these stones mentioned above that resonates the most with love, is that we can always welcome in more into our life. We can always make our lives more abundant. There is always room to open up the heart just a little bit more so that we can receive the love and gifts that others are meant to share with us. And should one of those gifts come in a little heart shaped box, we’ve got your energy and your new jewelry covered. Buy Rose Quartz hearts and Malachite from The Cristalline!